Creating Club Events? Learn more in these videos. Most clubs and organizations use the Event Calendar frequently and it's one of the major updates in ClubExpress version 8. The updates include some great functionality and flexibility in creating events. It also brings a new interface to event creation, so that the features can be further extended. There are now three videos to help bring you up to speed, and show some features that you might not already know about. The tutorial video is a 20-minute overview focusing on the changed and new features, and assumes that you are an administrator or event coordinator who is already familiar with the basic Events functionality. 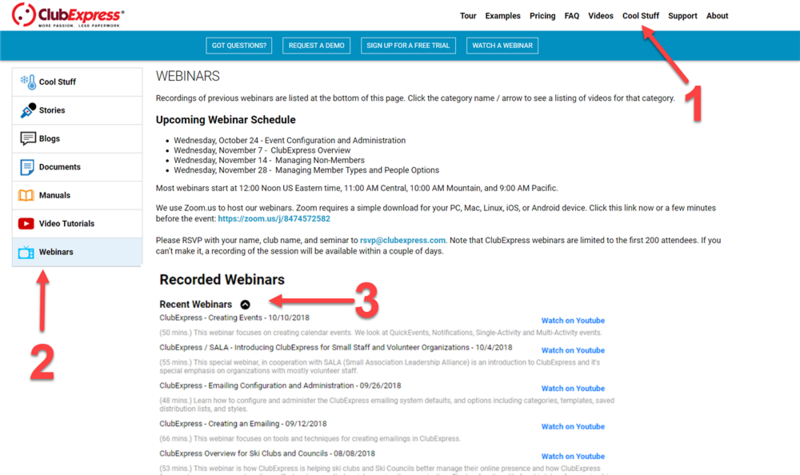 Two live 60 - minute webinars... deep dive into some event functionality. Just as a reminder, you can find all of the video tutorials on your Control Panel's Support tab, as well as in the Tutorial tab of the ClubExpress.com Cool Stuff page..